Kitchen Aprons There are 17 products. 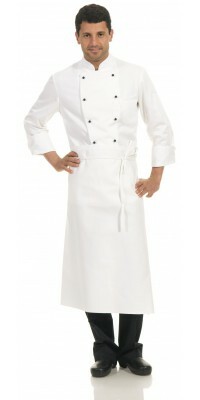 Corbara’s Kitchen Aprons: choose the more suitable apron model for your kitchen staff. Suitable for modern kitchen brigades the striped Pescara and Riccione Aprons, available in two striped patterns: blue and black. These apron are both with bib but of different dimensions, the first one suitable for women (cm A 70 x L 65) and second for men (cm A 100 x L 75). 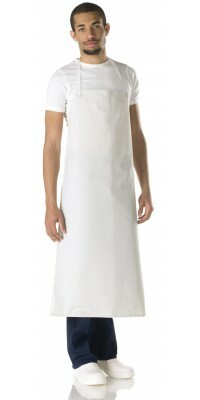 - Desio Apron, with bib (cm A 85 x L 70), normally used by the assistant chefs. Lastly, in order to complete this selection of cook apron, the PVC waterproof apron, an apron of big dimensions essential for the washer-up. 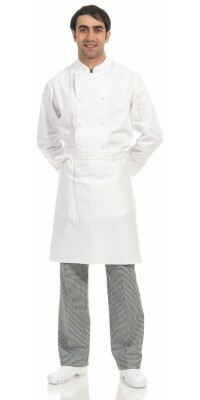 Look at the various categories dedicated to the chef jackets too: you will find other chef aprons matched with the jackets. 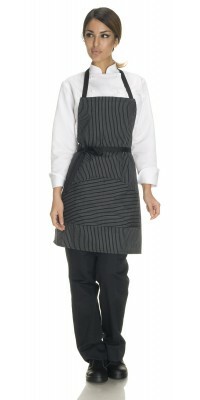 Unisex apron with bib, model Riccione one pocket applied Black Reno Striped size cm H 100 x W 75 Made of San Donato Gabardine, 65% Cot., 35% Pol. 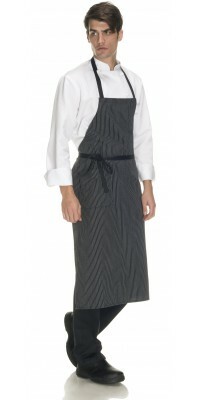 Unisex short apron with bib, model Pescara with big pocket in the middle Black Reno Striped size cm H 70 x W 65 Made of San Donato Gabardine, 65% Cot., 35% Pol. Unisex apron with bib, model Riccione one pocket appliedBlue Reno Stripedsize cm H 100 x W 75Made of San Donato Gabardine, 65% Cot., 35% Pol. 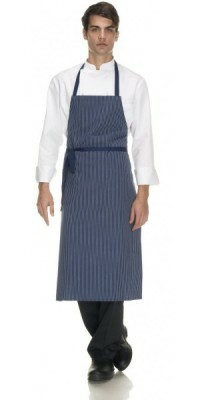 Unisex short apron with bib, model Pescara with big pocket in the middleBlue Reno Stripedsize cm H 70 x W 65Made of San Donato Gabardine, 65% Cot., 35% Pol.